A version of this article appears in Amuse with the headline: Jake and Dinos Chapman Are the Anti-Heroes We Need. For the last 20 years, Jake and Dinos Chapman have created works that have pushed the boundaries of subversion. Their tongue-in-cheek pessimism, which has polarised audiences for decades, couldn’t been more perfect for the current political climate. And one thing’s for sure, there is no unseeing their work. The brothers graduated from The Royal College of Arts, which led to assisting infamous art duo Gilbert and George. They later came into their own as part of the YBA set. Some of their most jarring works have included If Hitler Had Been a Hippy How Happy Would We Be, which decorated repurposed pictures of Hitler with rainbows; as well as the iconic, Fuckface sculptures, which saw phalluses placed on children’s faces. They recently had their LA debut at the UTA Art Space with the show To Live And Think Like Pigs. The selection of works had the brothers’ signature anti-aesthetic markings as well as the backbreaking craftsmanship they’ve become well know for. 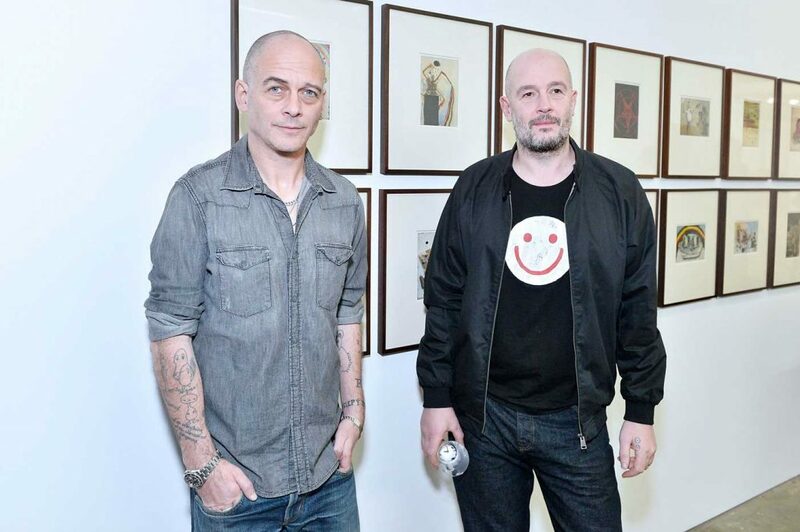 Amuse caught up with Dinos Chapman to talk about the show, collaborating from across the pond with his brother, as well as the similarities and differences between LA and London. There was a certain sense that all this pessimism you guys work with is kind of comfortable right now. I loved the Hellscape piece. The were so intricate and apocalyptic. It was such a blunt statement on Mcdonald’s. It’s kind of blunt and general. It’s kind of the most wide range of attack we can make on everything. To vocalise it as an attack on McDonald’s is wrong, to see it as an attack on the Second World War is wrong. All these things are only just partial. I think if it’s about anything, it’s about failure, grand gesture and humour. It’s everything. Well it’s not everything, but if it were given an infinite amount of time it would be everything. Were the Victorian pieces something you guys sourced, or were the pieces something you guys fabricated? I felt like they were the most intense set of works along with the video installation of the Ku Klux Klan. They are found paintings. The whole point is that originally they would be paintings of people who were relatively important. They were painted before photography was invented, so anyone who had a portrait made was important and hung on the walls of clearly wealthy people’s homes. So the idea being that at some point in their family’s history they either forgot, lost or damaged the paintings. The history of the family is of degeneration. Certain paintings would have been lost in status and they would end up in shops, not having been treated well. They bare the mark of having a rough few years when we find them and then we resuscitate them in a way that’s not that necessarily wanted by the person. What was the process of bringing together the happy face symbol with the dictator flag as your emblem? We are very interested in symbols, for example, stick man. When you draw a stickman it’s understandable by everyone. Everyone knows it’s a man. You could bend his arms and it makes him understandable. The smiley face has that quality: it’s universal. Within its universality, it’s really beautiful. It can be squeezed and pushed to be more than one thing. For example, in the 1990s the smiley face was used as a symbol for acid trips and rave culture. Just the fact that’s it’s an emotional symbol when mixed in the same area as swastikas. All these things can mean anything, depending on how you push it. So in the show, we have the Ku Klux Klan members with the rainbow socks. At the moment rainbows have a lot of good connotations but all those things can be subverted. Yes, the rainbow kind of symbolises hopefulness and new thoughts on homosexuality, but you can twist all those things. Most of the things we do are putting things together that don’t really belong together. What has your view on America been since moving to LA, do you go out much? I think a non-American’s view of America is tainted by American culture portrayed in films and TV shows. So you have a huge backlog of ideas of the place that are slowly stripped away. You end up with what I find a more complex country than you imagined before you got here. You imagine Americans are like the Americans you see on television and they’re not. In the same way Americans misunderstand people from England, or more specifically London. I find it very interesting being in a place that I don’t know and that I don’t fully understand and that I also don’t feel responsible for. I shouldn’t, but I could sit on the sidelines and watch. I have my own particular baggage with Brexit. But being here and seeing Americans having the same baggage just under a different name is quite interesting. And also in California, you’ve got a lot of different type of places. LA is a huge city encompassing a lot of different areas. I can’t find an archetype American and I can’t find an archetype Californian. It’s interesting figuring the differences and similarities. I think that what I like about being right here is that I don’t go out that much. When I was in London, I went out a lot. Here it seems to me that people refuse to go to out and in London people absolutely can not go to bed. I’m enjoying not being out so much. What is it like working with your brother since he’s in London most of the time? We’ve been working together for 20 odd years and throughout this 20 years, we’ve tried to change the way we work together so we don’t end up in a rut where we have a process that is unchangeable. I feel like that would lead to the most uninteresting work. I think we have changed the way we work according to each project. When I refer to the Chapman Family Collection with the African carving, we tried to get into the mindset of what it would be like to actually be one of those craftsman. We tried to be a very miserable unfulfilled middle-aged middle management recluse wreaking revenge on a model scale. Every time we plan something, we try to imagine it because there are two of us working together. It’s not a singularity, it’s multiplicity. So we feel like we have the ability and necessity to role-play at the time. Now we have 2000 miles between us so we have to reinvent how we work together. So it keeps it exciting? Yeah it makes it difficult, and difficulty makes things interesting. I think the comfort that a lot of people fall into in their declining years making art – I didn’t mean to say that but you know what I mean – is something that we’re trying to resist. Every time we make something, we kind of want to be reinvented. We fight against the idea of a linear approach to what we make. We don’t make piece A and then piece B and then piece C and then piece D. It’s more radial, we want everything to equally inform everything else we make. So the difficulty of having an eight-hour time difference and all of those things should make interesting work.